Do you know how the U.S. stacks up in literacy and education? Find out at Literate Nation. 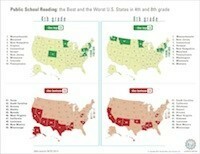 Check out the best and the worse states for reading. Is your state on the Top 10 list? Get the facts and the rankings from Literate Nation! Find out where your state ranks and let us know in the comments section below. This entry was posted in Reading, School Improvement and tagged Literate Nation, Nation's Report Card, National Center for Education Statistics, NCES, Reading levels by Wrightslaw. Bookmark the permalink.